Both fundamental analysis and technical analysis are common methodologies used by investors globally to research and forecast future trends in stock prices. However, they are different in several ways. Which study is better? 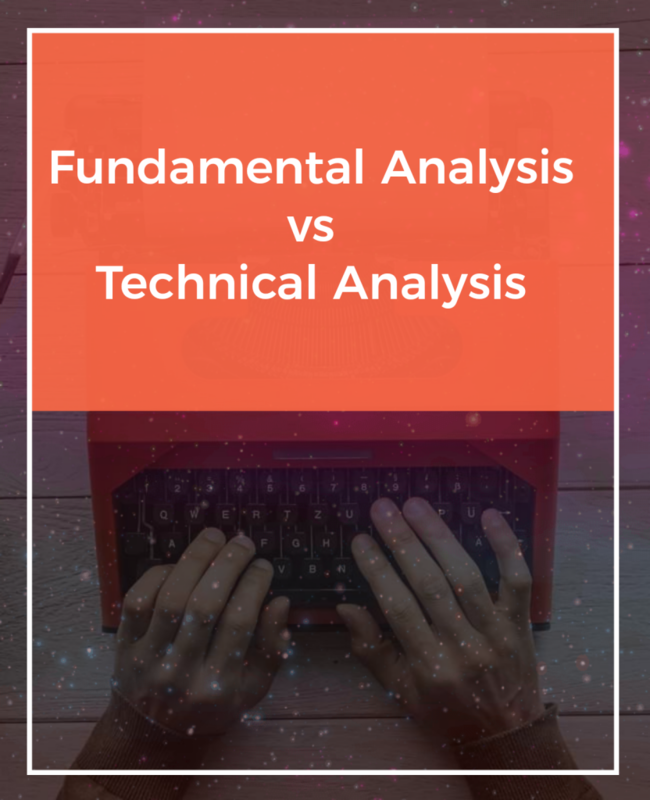 Let’s look at the difference between fundamental and technical analysis. Fundamental Analysis is a type of method used to evaluate the securities with an attempt to measure the intrinsic value of the stock which referred to as “Real Market Value” to identify undervalued stock. The most common data used in fundamental researches are to gauge company management efficiency, business competition environment, financial data such as earnings, assets, liabilities cash flow and dividend payout ratio which can be found in the annual report of a company. All of these data can provide a clear picture to investors where the company currently stands and help them to decide on long term investment. Fundamental analysis’s investors will study all the relevant factors that already exist; they will gauge to forecast future earnings and determine how much the stock value worth in future. They will only buy when the stock price is 20% below the intrinsic value which considers a range where they called ‘margin of safety’. In summarise, with an in-depth understanding of the financial information of a company, it allows investors to understand more about the future development of the company which can affect the company value in future. However, using this technique may be time-consuming if to compare with technical analysis. It entails hours of reading and understanding of the company financial health and business durability. Technical analysis is a short-term approach statistical method used to forecast the direction of future price through historical price and volume data. Instead of using the stock chart to identify patterns and trends, the technical analyst does not measure the intrinsic value of a security. They will use the analysis of the company’s technical indicators, such as moving average and price action such as support and resistance. It is to measure buy/sell pressure, an overall market trend to determine the right price to open or close a position to maximise their return and minimise the losses. Technical analysis use combined with stop losses and take profits order to traders to set their target profit and limit losses. To summarise, traders can judge on how the overall market is heading based on past price and volume data by using technical analysis. However, by using too many technical indicators may produce confusing signals which may affect trader decision. Besides, technical analysis does not take into account the underlying fundamental of a company. Investors use fundamental or technical analysis or by using both of these techniques to make an investment decision. Fundamental analysis attempts to calculate the intrinsic value of the stock by using the data such as revenue, expenses, growth prospects and competitive landscape. While for technical analysis, they will use the past market activity and stock price trends to predict future price movement. As with investment strategy, there are advocates and detractors of each approach. There can be different routes for different people. Margin financing is a facility extended to investors to borrow funds to buy a broader portfolio of products. Different investors with the different qualification will entitle to the different margin of finance (MOF). The margin is coming from the ratio of outstanding balance against the equity. Outstanding balance means the amount owed after deducting any cash deposit available. The equity means the sum of the value of securities pledged and purchased. An example, 50% of MOF given means the trader has to maintain an equity value of not less than 2 times of the outstanding balance. By using another word, as a short-term loan from a broker firm. Every borrowing comes with interest charged. However, the interest charged for margin trade is always the lowest compared to personal loan and credit card cash advance. Besides, this is the easiest way to increase your capital without all the paperwork, documents and application fees. The repayment on loan and credit card are by a monthly, and your integrity might be affected if fail to pay on time. However, the terms of repayment on the margin debt are flexible, and you should be able to follow on your schedule as long as you do not exceed the margin given. MOF is to leverage your investments and to increase the returns when the capital is limited. Some people might experience short of capital to buy some potential stocks so with a margin account; you can borrow the money from the brokerage firm to buy some instruments and get a higher return with hassle-free. Rather than saying its wrong way to invest, consider it as a calculated risk that will face by margin traders. When the margin trade makes a loss, the investor can experience losses up to 2 times the average. Before creating the maximum margin positions, it is essential to understand this risk and to be willing to accept it or, if not, to avoid margin trading. When the value of the underlying equity decrease and the outstanding balance exceed the MOF given, a margin call will be received. The investor will be required to add cash or securities to the account to increase the equity. If the investor does not act promptly, the brokerage firm has the right to sell the securities without the investor’s acknowledgement. While brokers will execute margin call when the account in substantial losses to protect themselves, the investors may suffer losses beyond the margin call and need to pay back the brokers. The investor should set a personal trigger point in every trade to minimise the damage. Margin trade should only happen in assets with significant return potential as the cost of interest on the loan should be counted as part of the costing. Derivatives are the securities which the value is derived from the underlying asset. Therefore, the underlying asset determines the price of the asset. If there are some changes in the price of the asset, the derivatives will also change along with it. There are few examples of derivatives, such as futures contracts, forward contracts and swaps contract which used by investors to hedge against risks. Today, we will look into the role of Future Contract and Options Contract. A future contract is a binding agreement between 2 parties, buyers and sellers where both of the parties promise to each other of buying or selling the underlying asset at a predetermined price at a future specified date. It is a standardized and transferable contract which traded on stock exchange. The future contracts include currencies, commodities, or financial instrument such as FGLD, FKLI, FCPO, FPOL, FUPO, FM70 and so on. Futures contract put an obligation on the buyers to honour the contract on the stated date, so he is locked into the contract. Companies enter into these agreements because they need to buy or sell the underlying products anyway, and just looking to lock in the price. Both buyers and sellers in the future contracts face a lot of risks as the prices could move against them. Let us assume that the market value of the asset falls below the price specified in the contract. The buyers will still have to buy it at agreed upon price earlier and incur losses. In other words, future contracts could bring unlimited profit or loss. A future contract comes with definite expiration dates. Most of the future contracts are not held until expiration, because some short-term traders close their position before expired and there are only a few people or companies who are really want to buy or sell the underlying products will continue to trade and hold their position until expired date. Short-term traders do not hold until expiration because they simply make or lose money based on the price fluctuations that occurred after they buy or short a contract. There is no upfront cost except commission when investors entering into a future contract. However, the buyers for the future contract are bound to pay the agreed-upon price for the assets eventually. This is done for the purpose of locking the commitment made by the parties. The execution of future contract can only be done on the pre-decided date as per conditions which have been mentioned in the contract. On this date, the buyer purchases the underlying asset. An option is a type of derivative which provides holders with the rights but not obligation to buy or sell an underlying asset at a pre-determined price in the future. Investors can compare the current market price (spot price) and the price on the option (strike price) to determine whether is it profitable to exercise in the option. By comparing both prices, investors can decide either to exercise the option or let it expire. There are three positions on which the holder can find it themselves. Call Option is “in the money” if the market price is greater than the exercise price. This is because the call option buyer has the right to buy the stock below its current trading price. Call Option is “at the money” if the market price and exercise price are the same. In this case, an option contract may be exercised. A call option is “out of the money” if the market price is less than the exercise price. In this case, it will better to let the option expire and buy the commodity at the current market price. The option seller (writer) can incur losses much greater than the price of the contract when compared to the option buyer (holder). The option buyers can opt out of buying it if the asset value falls below the agreed-upon price. This limits the loss incurred by the buyer. Option contract brings unlimited profits but it reduces the potential losses. The expiration date in the option contract is important to investors because it affects the price of an option contract. The longer the time for the expiration date, the higher the price should be and the longer the time the holders have for the option to exercise and potentially to make a profit. After the put or call option expired, time value does not exist anymore. In other words, once the derivative expired, the investor does not retain any rights to get along with owning the call or put option. In options trading, the options are either trade at a premium or discount offered by the seller of the option. The option premium is the price that you have to pay in order to purchase an option. The premium is determined by multiple of factors including underlying stock price, volatility in the market and days until the options’ expiration. The higher the premiums will be tied to the more volatile markets, even if the asset is priced less expensive, we also can see the premium rise when the market turns into a period of uncertainty. 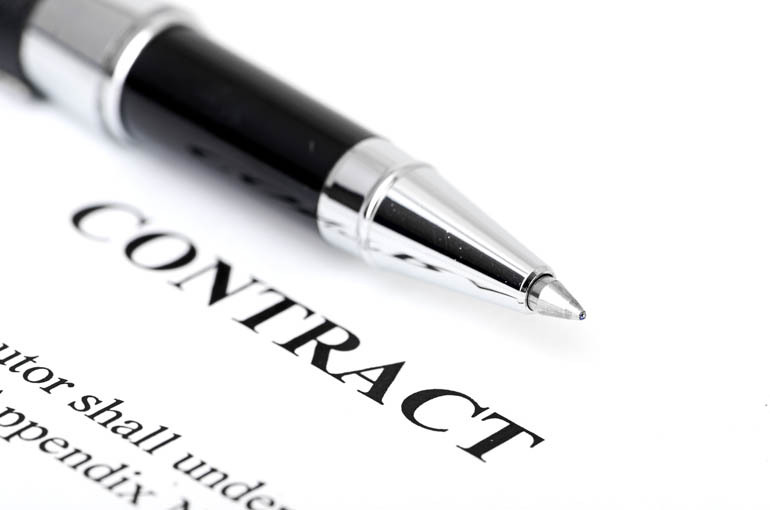 The buyer in an option contract can execute the contract anytime before the date of expiry. So, investors are free to buy the assets whenever they feel the conditions are right. In overall, both futures and options are derivatives contract which having its customization as per requirements of the counterparties. By reading this article, we will have more understand the difference between futures contracts and option contracts. As the name suggests, options come with an option (choice) while futures does not have any options but their performance and execution are certain. ETF stands for an exchange-traded fund. It is an open-ended investment fund listed and traded on a stock exchange. There are 3 types of ETFs listed in Bursa Market, which are equity ETFs, fixed income ETFs and commodity ETFs. In Malaysia, the ETFs were managed under licensed asset management companies like Affin Hwang Asset Management Berhad, AmFunds Management Berhad, CIMB Principal Asset Management Berhad and i-VCAP Management Sdn Bhd. ETF combines the features of an Index fund and a stock, which you able to invest to a counter with various stocks or bonds or commodities included. The features offer you to gain exposure to a geographical region, market, industry, commodity or even specific investment style such as growth or value. For example, MYETF DOW JONES U.S. TITANS 50 (0827EA) is a Shariah-compliant equity ETF traded in US Dollar. It comprising the 50 largest companies listed on NYSE and Nasdaq. It is good for investors who like to diversify their capital in US market with just buying the ETF. Another example, CIMB FTSE ASEAN 40 MALAYSIA (0822EA) consists of 40 constituent stocks from 5 ASEAN countries namely Singapore, Malaysia, Thailand, Indonesia and the Philippines. Investors who like to diversify their capital throughout ASEAN countries, this ETF provides a good simplified solution. The combination basket of stock inside the ETF is predetermined and will be managed by the fund manager through the market. Once the transaction successful, the investor will become one of the unitholders of the fund. The controllability of an investor is just the same as holding a stock counter, can sell whenever it worth to sell and buy whenever it worth to buy with personal judgement. The liquidity of an ETF relies on a combination of primary and secondary factors. The primary factors include the composition of the ETF and the trading volume of the underlying assets. ETFs can be invested in some asset types including real estate, fixed income, equities, commodities and futures. Within the equity universe, ETFs can focus on different market capital size and different level of risk. With the diverse selection of the ETF’s focus, the liquidity will be affected. Besides, the trading volume of underlying individual stocks does matter too. The more actively traded particular security is, the more liquid it is. Secondary factors are the trading volume of the ETF itself and also the investment environment. Taking an example to compare CIMBC50 with ABFMY1, CIMBC50 will get higher liquidity as more investors trading on. 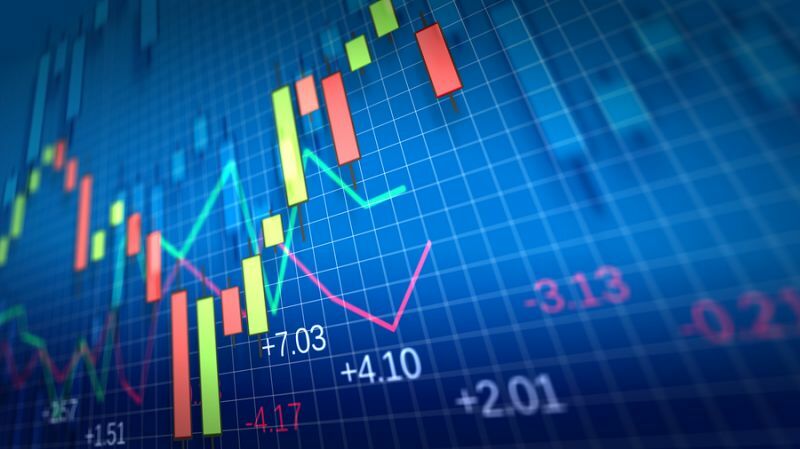 Due to trading activity is a direct reflection of the supply and demand for financial securities, the trading environment will also affect the liquidity. As Malaysia ETF market is not mature yet, investors could hardly to sell off their ETF at the desired price and make a big spread. Hence, it is more advised for a long-term investment for ETFs to trade on Bursa Exchange. 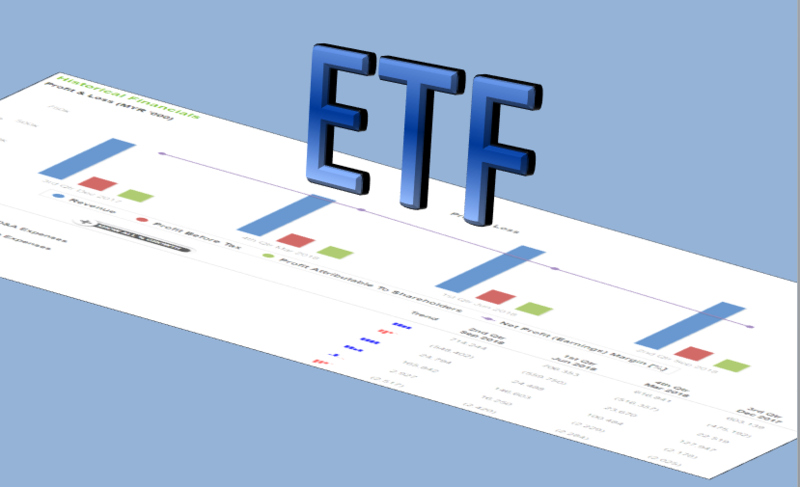 The list of the ETF constituents will be updated on the ETF’s website by daily basis. Hence, investors can accurately know the current stocks or underlying assets been held within the ETF. Overall, ETF is a financial product made up with the concept of a mutual fund but been sold or traded like a stock on the exchange. An investor can consider ETFs to diversify their portfolio and reduce their profile risk at a lower cost. However, for traders, ETFs are not that advisable as lower trading volume compared to stocks or commodities assets. A comparison table between ETF with stocks and unit trust has been prepared and listed below. Written by Evelyn Yong | 04 March 2019. 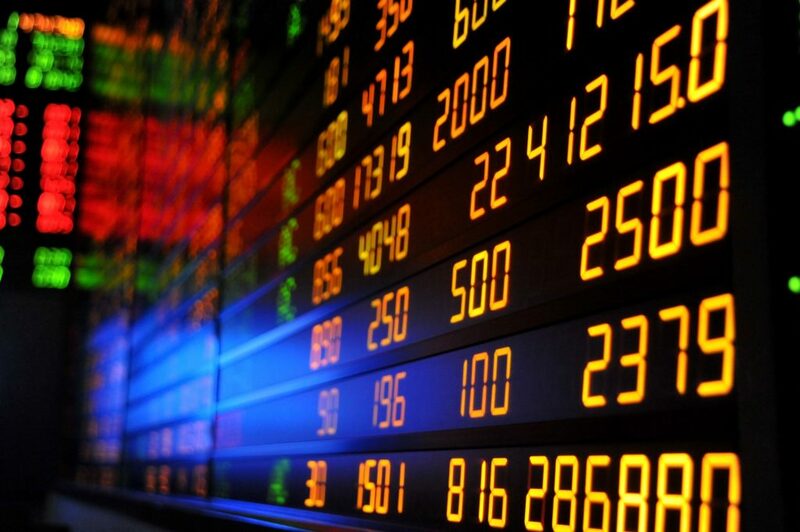 Shares generally have two types, which will be known as “Ordinary Shares” and “Preference Shares”. Ordinary shares and preference shares are distinguishing from each other based on their characteristics, benefits and rights that they offer to the holders of such shares. Let’s examine the different rights and benefits attached to them. Ordinary Shares are the equity shares of the company. Sometimes, ordinary shares are also known as “Common Stock”. Shareholders who have ordinary shares indicate that they have ownership in the company based on the portion amount of shares that they owned. For examples, if you have purchased 30 shares out of 100 shares of XYZ Company, it means that you have held 30% of stocks of the company or you have owned the company 30%. Ordinary Shares carry voting rights. Shareholders have some privileges to get voting rights at the general meeting. They can appoint or remove the directors and auditors of the company. Each of the shareholders has rights to gain profits that earned by the company as well as to take the dividend. Ordinary Shareholders have rights to receive dividends if the company makes profits. The dividend paid by the company is not fixed. Usually, when a company is just getting started, they do not pay the dividend and the entire money earned will be reinvested into the business for further development. Sometimes, the dividend will be paid to the shareholders only after all the payment of the liabilities had been paid. They are referred to as “residual owners”. They received what is left after all other claims on the company’s income and asset that have been settled. However, equity shareholders have no rights to get arrears dividend for previous years. In the event of winding up of the company, the company must pay costs, wages, statutory contributions and taxes first followed by its creditors. Any capital that remains after paying the creditors will then allocated to the shareholders. Ordinary shareholders receive their share of capital after the preference shareholders are paid. When it comes to redemption, ordinary shares cannot be redeemed by the company. Ordinary shares are also cannot be converting into preference shares. Preference shares represent an ownership stake in a company, and sometimes it called preferred stock. Preference shares can have both equity and debt characteristics, which favoured by investors who have different priorities and interests to safeguards. Preference Shares have a priority claim over the company’s assets and earnings. The shares are more senior than common stock but more junior relative to bonds in terms of claim on assets. Preference shareholders do not have voting rights on preference shares. However, they have rights to vote on the matters that directly affect their rights like a resolution of winding up of the company, or in the case of reduction of capital. Besides, shareholders of preference shares may have statutory powers to claim if the dividend remains unpaid for not more than 12 months from the due date of the profit or lesser. Preference Shareholders enjoy priority first in the payment of profits and dividend. It promises the shareholders with a fixed dividend, both when the business is operating, and also in the event of a company entering into liquidation in the future. However, they are not paid first since the company needs to pay off the liabilities. But, they get paid off before the ordinary stockholders. While for the arrears of dividend, the shareholders will get arrears of dividend along with the present year’s dividend if it does not pay in the last previous year. In the event of winding up of a company, preference shareholders are entitled to receive payment of capital after the claims of the company’s creditors have been paid, at the time of liquidation. In short, preference shareholders have preferential claims over dividend and repayment of capital as compared to equity shareholders. Sometimes, some of the companies may issue redeemable preference shares on the condition that the company will repay the amount of share capital to the holders of this category of stocks after the fixed period or even earlier at the discretion of the company. The redemption must come from available profits of the company which would otherwise have been available for distribution of dividends or it must from the proceeds of a new issue of shares that made for redemption. There is also a share called convertible preference shares. Convertible preference shares are preference shares which are issued with the right or option to convert to ordinary shares in the future, often at a pre-determined time frame and rate. Voting Rights Have voting rights No voting rights. Investors must understand the difference between ordinary shares and preference share. Investors should consider preferred stocks when they want a steady stream of income. The preferred stocks dividends pay a higher income stream than bonds. Although lower, the income is more stable than stock dividends. Therefore, investors should consider themselves which types of stock are suitable for them. We had covered the topic of the Discounted Cash Flow Model last time, today we will focus on the next valuation calculation method, Discounted Earnings Model. Also known as Discounted Future Earnings, this model is to forecast the earnings value of a firm and firm’s estimated terminal value at a future date. Terminal value represents all future cash flows that will reflect the returns occurred in future which they are nearly impossible to forecast. The future earnings and then will be used to discount it back to the present value by using the appropriate discount rate. The sum of the discounted future earnings will be equal to the estimated value of the firm. By using this model, investors must make sure that the earning of the company is always positive. If it is negative, this model cannot be applied. Note: We can use Adjusted Earnings per Share or Historical Earnings per Share of the company based on investor’s perspective and determination. 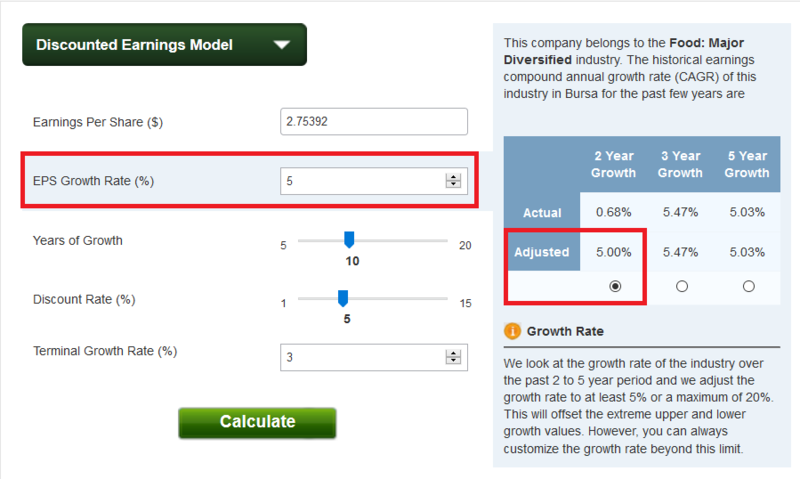 Let us look at How to fill Up the Figures in ShareInvestor WebPro to get the intrinsic value for Nestlé Berhad by using Discounted Earnings Model as an example. Earnings per Share (EPS) is a financial ratio that used to measure or indicate the profitability of a company. To get Earnings per share, the total earnings of a company available to common shareholders will divide by the total number of common shares outstanding. 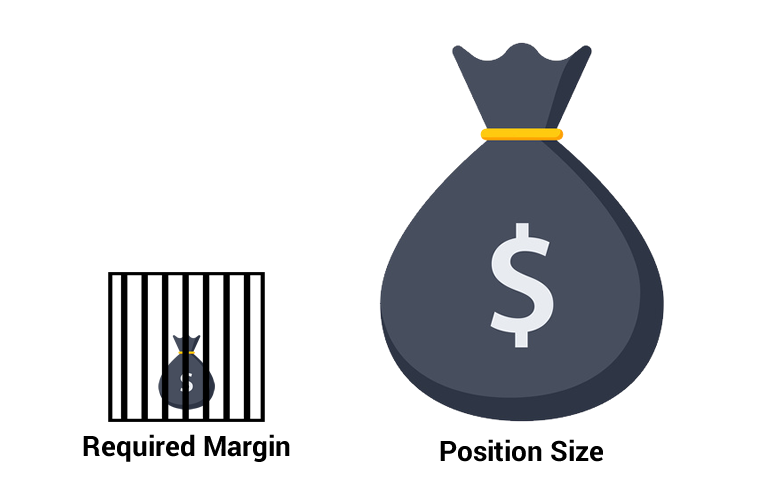 In other words, this is the amount of money each of the shares will receive if all of the profits distributed to the outstanding shares at the end of the year. Based on the photo above, insert 2.75392 to the Earnings per Share column. Note: You have to right-click the stock and choose financial, then you can found Earnings Per Share in the part of Per Share Data (Adjusted). For EPS Growth Rate, we can use the industry average EPS growth rate of the company in the model provided, or we can use the average EPS growth rate for the company based on selected years. A company CEO may project the years of growth and announce it to the investors during AGM ( Annual General Meeting). Sometimes, we also can saw some news from the newspaper regarding the years of growth for a particular company. The other ways are looking into the past industry growth cycle. If the industry cycle usually tends to continue to grow for 10 years, you can take this number as a reference. Let us assume that the years of growth for Nestlé Berhad is 10 years. As we have discussed in the previous Article of “Understanding Discounted Cash Flow Model (DCF)to find intrinsic value”, we know that Discount rate is the required rate of return for investors. The rate of return would be applied to the future earnings or cash flow to discount it back to the present value. It could be the risk-free rate of yields such as government treasury bonds or the expected rate of return. We will use the Capital Asset Pricing Model (CAPM) as below to find the Discount rate for Nestlé Berhad based on its own risks level. Beta is a measure of stock’s volatility which will use to analyse how much returns will fluctuate about the overall market return. 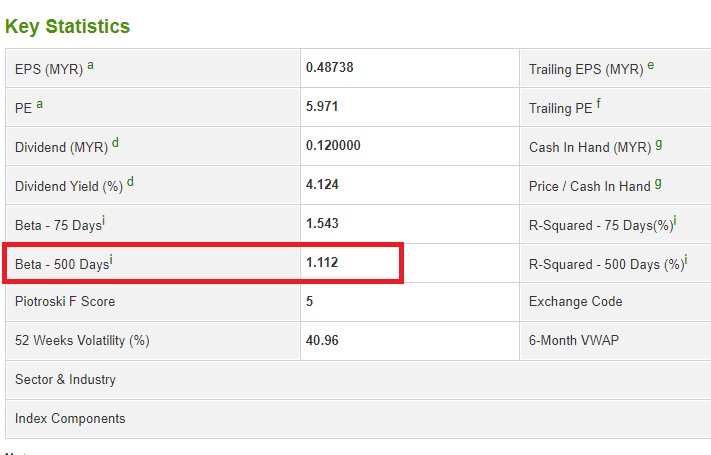 Beta equal to 1 indicates that the stock price moves together with the market. The beta of less than 1 means the stock is less volatile than the market. A beta which is greater than one means the stock price is more volatile than the market. We will obtain the beta for Nestlé Berhad from the Factsheet of ShareInvestor WebPro which is 0.40 on 16Jan2019 as the picture below. The beta that I have selected is beta (500days). There is no right or wrong choosing beta (75days) or beta (500days). Note: Select particular stock and select FactSheet, and you will found Beta (500days) at the vital statistic part. To find the expected market return of the stock, we can use the Compound Annual Growth Rate (CAGR). Compound Annual Growth Rate is a useful tool which uses to determine the annual growth rate of an investment which the values have fluctuated widely from one period to another. I will take 10 years of the stock to measure the expected market return from the Year 2009 to the Year 2019 for FBMKLCI. We calculate the CAGR after we have all the beginning value, ending value and number of years in the FBMKLCI. The expected market return that we have is 0.06657. After we got all the figures as above, we can use it to calculate Capital Asset Pricing Model to get the Discount Rate. The discount rate we will get is 5.14%. Therefore, I will round off and insert it as 5% into the Discount Rate column. Terminal Growth Rate will be used to estimate the company’s growth beyond the projection period to calculate the terminal value of a company that will expand its future income beyond the initial few years’ projections. Note: the terminal growth rate used must always be lower than the discount rate. There is no right or wrong to use Real Gross Domestic Product (GDP) or Global Gross Domestic Product (GDP). I will use Growth Rate of Global Gross Domestic Product (GDP) for this year 2019 which is 3% equivalent to 0.03. Now we know that Nestlé Berhad has an intrinsic value of RM169.37. The current market value of Nestlé Berhad is RM147.30 (Based 16 January 2019). Based on the Discounted Earnings Model, it shows that Nestlé Berhad currently is in fair value due to the margin value of the stock is not much. Written by Stella Goh | 23rd January 2019. 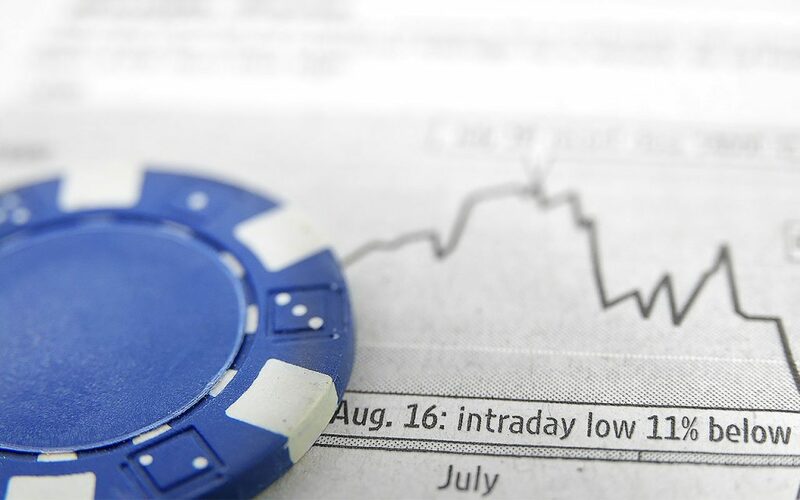 Investing in the stock market could be much more accessible nowadays as there are many resources and useful tools that help investors making an investment decision. In ShareInvestor WebPro and ShareInvestor Station, there are three new developed models which are Gordon Growth Model, Discounted Cash Flow Model and Discounted Earnings Model. Among all these models, they could help investors to find the intrinsic value of the particular stock — many complicated calculations and formulas to find the intrinsic value. ShareInvestor WebPro has simplified the process. It allows users to plug in the relevant figures and it automatically calculates the valuation of the company. Today, we will talk about the Discounted Cash Flow Model to helps an investor assess the viability of a project or investment by calculates the Total Free Cash Flow based on the projected growth rate and discounts back to the present value. If the company value derived through Discounted Cash Flow Model is higher than the current market price per share, the investor shall start to monitor this type of company. This model requires a positive free cash flow to derive the intrinsic value of a stock. 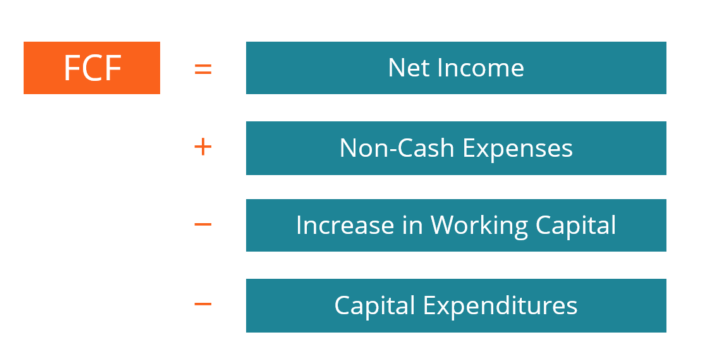 If the free cash flow of the capital is a negative figure, this model cannot be applied. 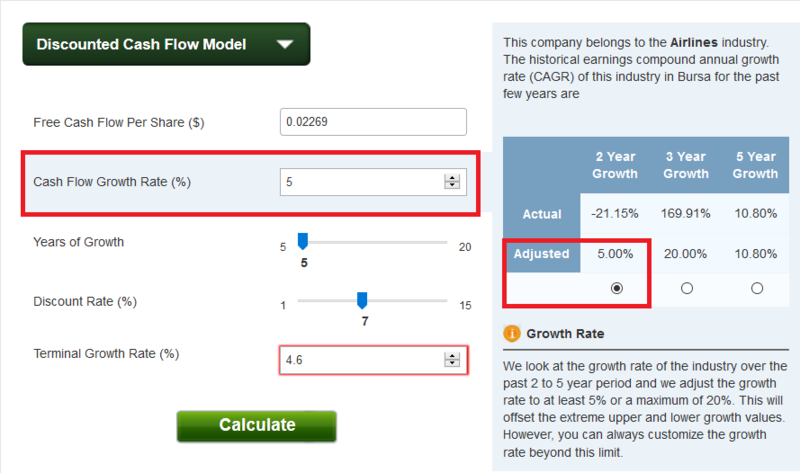 Let us look at “How to fill up the figures in ShareInvestor WebPro to get the intrinsic value for Air Asia Berhad” by using Discounted Cash Flow Model as an example. Based on the photo above, insert 0.0227 to the free cash flow per share column. Note: You need to right-click the stock and choose financial, then you can found the free cash flow per share in the part of Per Share Data (Historical). A company CEO may project the years of growth and announce it to the investor during AGM (Annual General Meeting). The other ways to are looking at the past industry growth cycle. If the industry sector usually tends to continue to grow for 5 years, you can take that numbers as a reference. Let us assume that the year of growth is 5 years. Therefore, insert 5 years into years of growth column. The discount rate is the required rate of return for investors. If he/she perceives the investment relatively risky, he may want to put a higher discount rate. For the public companies, there’s an assumption that the business was to continue to operate for longer compared to smaller private companies which may have a shorter life span. 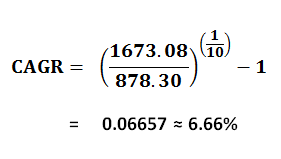 To find the Discount Rate, we will use the Capital Asset Pricing Model (CAPM) formula as stated below. Capital Asset Pricing Model (CAPM) describes the relationship between systematic risk and expected return for the assets. This model is also widely used for securities to generate the expected return for the stock. The risk-free rate in the CAPM will account for the time value of money. Beta is used to measure volatility or systematic risk of a security. A beta of 1 indicates that the security price is moving together with the market. A beta of less than 1 means the security will be less volatile than the market. A beta which is greater than 1 indicates that the security’s price will be more volatile than the market. For Beta of Air Asia Berhad, we will obtain it at the Factsheet from our ShareInvestor WebPro or ShareInvestor Station which is 1.112. I will choose the beta of (500days) which is 1.112 as common. There is no right or wrong choosing beta (75days) or beta (500days). 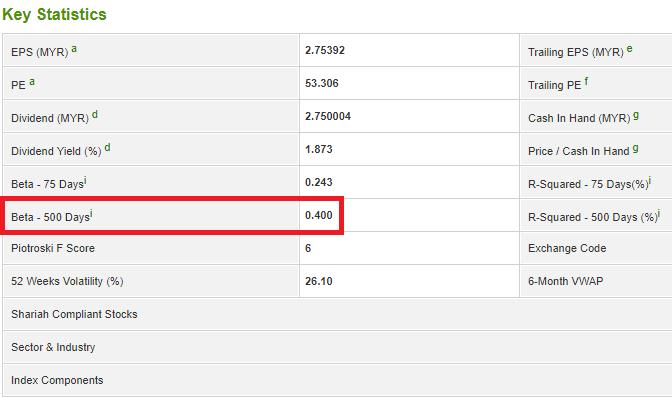 Note: Select particular stock and select FactSheet, and you will found Beta (500days) at the key statistic part. We need to use Compound Annual Growth Rate to find the expected market return of the stock. Compound Annual Growth Rate is a useful tool which used to determine the annual growth rate on an investment which the values have fluctuated widely from one period to the next. Beginning Value for FBMKLCI in the Year 2009 = 878.30. Period from the Year 2009 to the Year 2019 = 10 years. After we have the beginning value, ending value and number of years based on particular years in the FBMKLCI into the CAGR formula, the expected market return we get is 0.066. After we got all the figures, we can calculate the Capital Asset Pricing Model to get the Discount Rate.The discount rate we get is 6.89%. Therefore, I will round off and insert it as 7% into the Discount Rate column. Terminal Growth Rate will be used to estimate the company’s growth beyond the projection period and will be used to calculate the terminal value of a company which will be expanding its future income beyond the initial few years’ projections. Note: the terminal growth rate must always lower than the discount rate. We will use Growth Rate of The Country Real Gross Domestic Product (GDP) for this year 2019 which is 4.6% equivalent to 0.046. After we have all the info, we can key into our ShareInvestor WebPro or ShareInvestor Station platform and select calculate to get the intrinsic value of Air Asia Berhad. The intrinsic value for Air Asia Berhad is RM 1.01. Now we know that Air Asia Berhad has an intrinsic value of RM1.01. The current market value of Air Asia Berhad is RM2.95. (based on 10 January 2019). Therefore, it indicates that Air Asia Berhad currently is overvalued since the current market value is larger than the intrinsic value of the company. Written by Stella Goh | 11 Jan 2019. A stock split is common in nowadays stock market and some of the successful companies will exercise stock split multiple times throughout a decade. But, what does stock split means for the company and the shareholders? If you are holdings a stock which is going to split, don’t worry. We will discuss this topic for you to have a better understanding. It is a corporate action declared by the board of the company with the purpose to increase their number of total share of a company by splitting each of the shares. When it happens, the share price drops proportionally due to the result that each of the shareholders will own more shares with the same proportion of ownership in the company. How Does It Impact The Share Values? Let us look at 1 of the example. If the company has 10,000,000 issued share priced at RM50 per share before share split, it will have a market capitalisation of RM 500,000,000 (10,000,000 x RM50). If the share split occurred at 2-for-1, the total company number of shares would double to 20,000,000 shares. The price for each of the share to be adjusted to RM25. (RM50,000,000 / 20,000,000). For example, a shareholder with 1000 shares finally will have 2000 shares in total, but the value remains the same. Based on the example above, it is also clearly indicated that there is no change in the total value of shares. The cost of a single stock will become cheaper, and only the total number of stock in the market will increase. Why does Stock Split happen? Stock splits occurred when the company management wishes to add liquidity of their stock by diluting it to reduce the cost per share to the reasonable price level. When the stock price has become less expensive, it may attract more new investors to invest in their company even though the underlying values of the company do not change. Besides, a company that is practising a share split also can indicate a good signal that the company is doing well enough and investors will assume that the company will lead the share price to go higher in future. Are Share Split Good For Investors? When there is stock split occurred, it does not mean that the company will continue to do well in the future. The company split its stock when the share price has risen enough, but it does not indicate that the share price of a company will continue to grow in the future. Investors must always remember that when they owned more shares for the stock split, the overall value of their holdings will remain the same. Some of the investors may say that stock split is a company doing well in their business and it may consider as a buy signal. It is not correct in this statement. Investors should always look at the whole picture of the company before making an investment decision. Investors can use stock split as an indicator, but further market evaluation is needed. Should You Buy A Stock Before or After Stock Split? For the investors who will invest for long-term, it does not matter whether he/she buys the stock before or after the stock split. Let’s us look at scenarios as an example. Let’s say I could purchase 1000 shares of a company which is trading at RM0.50 today, or I could purchase 2000 shares of the company at RM0.25 tomorrow after a split, the outcome will be identical. The only thing that can vary from the day before or after the split is the actual price of the shares. Investors need to be methodical when they are trying to purchase the stocks before or after the split announcement. The stock split is a good thing for small investors who seek good company within their affordability. However, investors are not advisable to directly buy the shares before or after the split without doing further research. Written by Stella Goh | 12th December 2018.